More beautiful than you could ever imagine! The flash of light or colour you may see as you look into the waters of a stream, vlei, lake or dam will alert you to the presence of fresh water fishes in such waters but will go no way to bringing home to you the fragile beauty of the fresh water fish species with which we are so abundantly blessed. There are approximately 280 species of fresh water fishes in the Southern African region, of which about 260 are indigenous species and 22 introduced alien species. 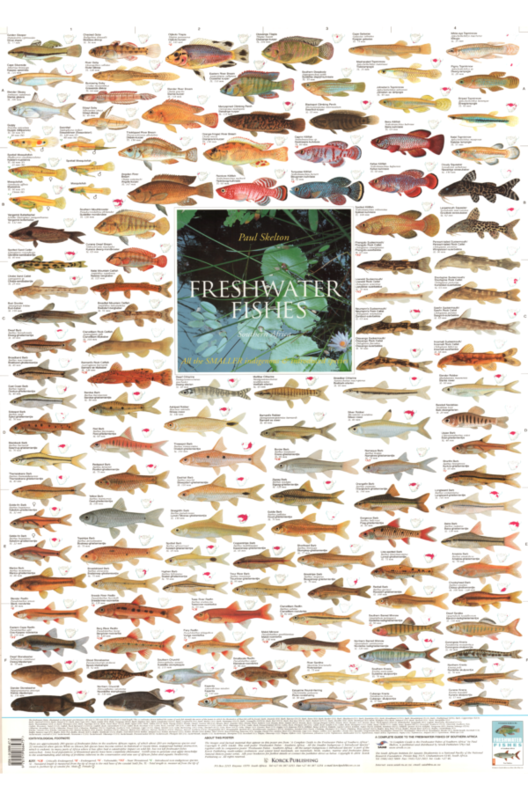 The Korck Publishing wall poster “Freshwater Fishes – Southern Africa –All the smaller indigenous & introduced species” illustrates 123 fish species, ranging in size from very small indeed (approx 20 mm) to not much more than 160 mm. These fishes are too small to interest anglers, but their amazing colouration and delicate forms serve to delight us all.